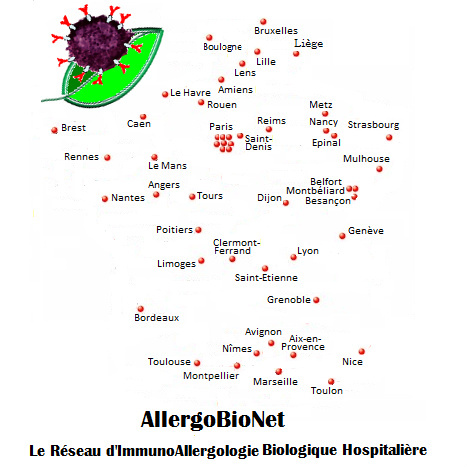 Dans le but de réunir leurs compétences dans le domaine de l’immuno-allergologie biologique, les praticiens exerçant dans un cadre hospitalier ont convenu de constituer une association déclarée, régie par la Loi de 1901. La veille scientifique et technologique, incluant l’évaluation des réactifs (performances et coût). Allergy. 2015 Feb;70(2):180-6. doi: 10.1111/all.12546. The importance of EN ISO 15189 accreditation of allergen-specific IgE determination for reliable in vitro allergy diagnosis. Lambert C, Sarrat A, Bienvenu F, Brabant S, Nicaise-Roland P, Alyanakian MA, Apoil PA, Capron C, Couderc R, Evrard B, Jaby D, Hémont C, Lainé C, Lelong M, Mariotte D, Martinet J, Rénier G, Sainte-Laudy J, Tabary T, Treiner E, Uring-Lambert B, Vigneron C, Vivinus M, Witthuhn F, Vitte J; AllergoBioNet sIgE accreditation interest group. Allergen-specific serum immunoglobulin E detection and quantification have become an important step in allergy diagnosis and follow-up. In line with the current trend of laboratory test accreditation to international standards, we set out to design and assess an accreditation procedure for allergen-specific serum IgE. Method validation according to the accreditation procedure under the EN ISO 15189 standard was carried out for allergen-specific immunoglobulin E determination using the fluoroimmunoenzymatic method ImmunoCAP(®) (ThermoFisher). Data were produced by 25 hospital laboratories in France. A total of 29 allergen specificities including mixes, extracts, and molecular allergens were assayed. Allergen-specific serum immunoglobulin E concentrations ranged from 0.1 to 100 kUA /l. Repeatability, reproducibility, and accuracy results fulfilled method validation criteria for automated laboratory tests and proved similar irrespective of the allergen specificity, allergen-specific serum immunoglobulin E concentration, or individual laboratory. Allergen-specific serum immunoglobulin E determination with the fluoroimmunoenzymatic method ImmunoCAP(®) is a highly repeatable, reproducible, and accurate method which may be considered as a single analyte assay in view of the EN ISO 15189 accreditation procedure. Chers amis, pour ses 4 ans AllergoBioNet s'offre son site web tant attendu. Notre nouvel espace de communication et d'information se mettra en place progressivement. D'ores et déjà, le lien vers le premier article publié grâce au groupe de travail sur l'accréditation des IgE. Un grand bravo!